Gemsboks have tough hides, so if you’ve never hunted one, we’ll be sure you bring the right ammo for Gemsbok hunting. Hunted for both their lean meat and their horns, you’ll reap lots of rewards from this animal. The cow’s horns are actually longer and more slender than that of the male, but it’s a bit difficult to tell them apart. Both have horns that extend backwards and outwards and diverge widely, but the female’s are at more of an angle than those of the male. Both are light brownish-grey, black and white face and a long black tail. All the legs have white socks with a black patch on the front ones. Watch out for those pointy things! When you go Gemsbok hunting at our V-Bharre Hunting Ranch, you’re going to score spear-like horns that are so sharp, they were used as spears by African hunters. These antelopes, native to southern Africa, use their horns as weapons against predators like lions. When you book one of our Gemsbok hunting packages, you’ll be able to see for yourself just how sharp they are. Males can grow to 55” at the shoulder and weigh from 400-550 pounds. They’re big fellows. Females weigh in around 400-460 pound. They can run up to 35 mph and go days without water. Gemsbok are one of natures unique animals. 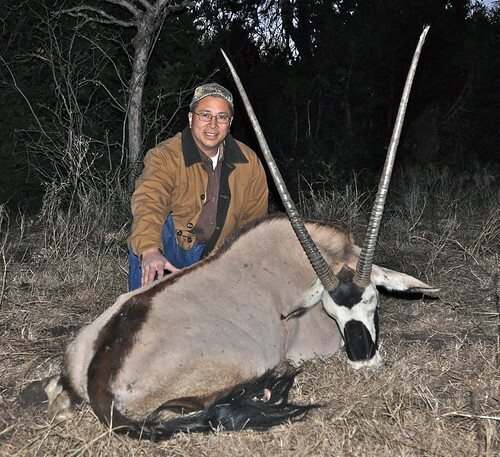 Contact us now to know more about our Gemsbok hunting packages!